May | 2012 | I Haven't Had My Coffee Yet -- Don't Make Me Kill You! Written by DBE intern, Elena Klinova. Of all our analog gear there is one piece that we use in every session, the Summit MPC-100A Mic Preamp and Compressor. This piece has a unique character and adds harmonics to the sound which makes the instrument seem more live and pushes it “out of the box”. Starting with the signal flow, there are two sections, as implying by its name, a mic preamp and a compressor. To get the signal inside we use preamp section with DI input on the front panel and line or mic inputs on the back panel. There is a front panel 48 volt switch for a condenser microphone. If you use the DI you can adjust the impedance as might be appropriate for a guitar or keyboard. Once inside, signal goes through the gain amplifier which can change the sound entirely. Even at moderate gain, the MPC-100A will add some warm tube saturation to the sound. If you push the signal level it starts to sound more convex and gritty. In fact, it adds certain amount of distortion to the sound which can be pleasant for some instruments and not very good for others. By the way, there is a bypass switch on the front panel but it works only for compressor so the sound will go through the pre-amp gain anyway. But if you didn’t want this amplifier to work then you wouldn’t have inserted it into the chain, would you? Also this section has a LED indicator showing when the tubes saturate, and phase and pad switches that can be handy in some situations. The next section is the compressor/limiter with it’s own gain and LED indicator. Along with output switch, this stage becomes a powerful tool to control the level and saturation of the sound. There are also the usual parameters that you can adjust: threshold, slope (ratio), attack and release time. In addition the link switch allows you to use two MPC-100A in a pair. For me, if you want to use this piece of gear properly you should drive the tubes. I would prefer to chose a signal which would love saturation or distortion. It could be bass or electric guitar or anything that needs more grit in the sound. Probably I wouldn’t use it for smooth sounds and vocals since you’ll end up with a too soft or too distorted sound. JT adds: The MPC-100A is a beast on bass, kick, snare, guitar, and occasionally keys. Its function ranges from moderate warmth to full on distortion. It’s just not a subtle piece. That’s why I love it. Elena is right, we use it on every session. 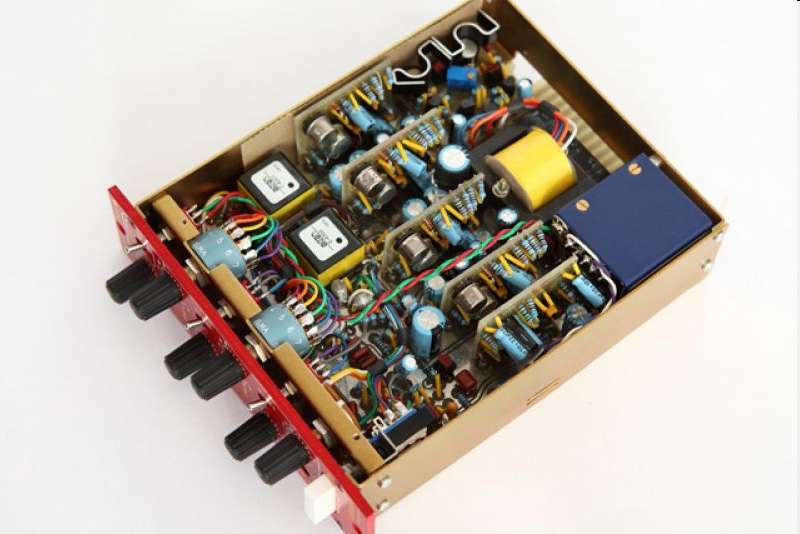 The Little Devil EQ was Chandler Limited’s first step into the world of 500 series EQ modules. Priced at just over $1,200 retail, the Little Devil wears a a fiery red coat that lives up to its name. Looks aside, the unit delivers amazing flexibility and a very strong tonality that really adds great sound to most signal chains. The knobs on the Little Devil are very well mounted and detented for easy recall. They don’t move past where they are supposed to or wiggle about. There are six knobs total; Bass, low mid frequency, low mid level, high mid frequency, high mid level, and treble. Both low and high mid knobs have a selectable bandwidth, and the unit has a two button, three-mode high pass filter, cutting frequencies at 47Hz, 82 Hz, or 150 Hz (with both buttons pressed). The performance of the module is very satisfying. With all controls set to zero, flipping the bypass to ‘on’ alone introduces a slight volume boost and tonal coloration. Just the signal path of the device makes the signal sound bigger. The tone of the coloration is very upfront and modern, unlike gear aimed at a more “vintage” sound. I believe the reason for this is that the Little Devil EQ is not trying to be a clone of any other piece of gear. [Actually it’s based on the British inductor EQ designs like the Neve 1081, but with Wade Goeke’s modern interpretation. – JT] Like it or not, it brings a sound unique to itself. Very usable on real or harsher instruments, the Little Devil EQ does everything its supposed to and brings a little bit extra. The verdict: I have found this to be a wonderful and reliable piece of gear. Sonically, nothing sounds quite like a Little Devil EQ. ” What did he know and when did he know it? ” This key question from the Watergate era brought down a President. It can also bring down – or elevate – a song. Remember that the presentation of a song by a writer to a listener is a social interaction – a conversation of sorts. Like any communication, if the songwriter cares about his/her message, the goal of the interaction is to forge a connection between singer and listener, so that both are on the same wavelength with common understanding. Communication between people is propelled forward through a flow of information – whether you are telling a story, giving instruction, recounting your trip abroad, or describing your aches and pains, the listener stays engaged only as long as information is flowing in. As soon as this inflow ceases, the listener’s attention goes elsewhere. Would you continue to read a book or watch a movie if it was not providing you with new information that moved the story along and kept your attention? The same principle applies in a song. As long as information is flowing, the listener stays focused and engaged, drinking in that information to stimulate images, feelings, ideas, memories – all the things that songwriters’ want their listeners to experience. In general, when a listener is hearing a song for the first time, you have about 30-45 seconds to ‘hook’ them and make a connection. Great songs work because they have a tremendous amount of information flowing to the listener in the first few lines. By the end of the first verse, we usually know a lot about who/what/where/when/why/how. Consider each syllable in a lyric as a prime real estate lot, and your job as the developer is to get as much use out of each lot as possible. For each line and each phrase of your song, ask “What does the listener now know?” This is your key to a successful song . Songwriting great Gretchen Peters said in an interview that writing a song is “almost like haiku, you have to really, really tear things down (to the essentials). If a line does not introduce new information, it is not moving the song forward, so why is it there? If it is there just to take up space, or just because you needed a rhyme, you are wasting valuable real estate. Make each line work for you, to keep a sense of forward motion. Listeners do not have long attention spans. You need to do all that you can to earn their attention, and then reward them with a constant flow of interesting information. There are some key pieces of information that are essential in any song. Whenever a character is introduced in a lyric, whether by name or by “he/she/you/they”, the listener quickly needs to know who the person is, what their relationship is to the singer and/or other characters, and why they are saying what they are saying (or why something is being said about them) i.e. what is the current and/or past situation that led to these words being said? In short, why should the listener care about the character? Without those pieces of information, any character in a song is a distant stranger with whom we don’t see a reason to connect. Information about when and where it’s all happening may or may not be essential, but those bits of detail usually provide a sensory anchor for the listener. Most great songs provide a sense of when and where. To get through each day, Harry and Joe. What do we know? A girl names SaraBeth is at a medical facility awaiting a diagnosis. You know she is terrified. You know she had a fall awhile ago and hasn’t been right since. And you know she probably has cancer (leukemia). Again, in a few phrases, we know the current situation and the backstory of the character. We are invited into the song to accompany this person on the journey she is about to take. Getting all this information out in the beginning allows the writer the luxury of using all the rest of the song to develop the tale. True to the key songwriting principle of show, don’t tell, the song never uses the word ‘cancer’. In general, a song about something specific like cancer, or abuse, or divorce, or pollution, or addiction etc, should never need to actually use the word. We should know by what we are shown that this is what it’s about. Just follow the simple rule that any time something new mentioned ( a character, an incident, a memory, an idea) the listener needs to know right away all the relevant information about it . Don’t delay it, don’t omit it. Be especially wary of words like “the truth” , or “the past” or “that day” or worst of all, “It”. Do not “it” unless we clearly know what “it” refers to. Words like this are often used in a lyric to encompass some major set of circumstances and details that you know about, but be mindful that your listener knows absolutely none of it. Once you use a word like that you have to explain it right away. Best to avoid it and just show the listener what you see in your mind’s eye. (show, don’t tell). Within the first two lines we know the two people are an adult (the singer) and a sleeping baby. They have been driving for some time and it's raining. The next lines tell us that it's  night, there is a sense of desperation, they are running from something, they don't have much money, the girl is Emily, and the singer is probably her mom trying to keep her safe from something. We know all this by what we are shown, not what we are directly told. Here’s another information-rich opening verse from Neil Diamond’s “Brother Love’s Traveling Salvation Show”. It’s Brother Love’s Traveling Salvati0on Show…. In these lines, (which also contain 6 rhymes, plus assonance and alliteration), we know When (August, night); Where (edge of the road leading out of the town); What is going on (gospel music); and How the air smells (sweet, grassy); In the scene change: “Move up the road to the outside of town” , as the visual camera moves, the listener is brought along, and we hear a new sound, i.e. singing from a ragged tent in a clearing. In this lyric, the information is focused on setting a scenario, providing detailed sights, sounds and smells, so that “you and me” are invited into the same vivid world. This type of lyric writing is both journalistic and cinematic, like describing the world through movie cameras where the lenses can zoom in and out and scenes can pan and cut between locations and characters, providing all the relevant information. It is the art of using words to reach the visual centers of the listener’s mind. And considering how many people go to movies, rent videos, and watch TV and live events, it makes for effective lyric writing. Who dies from too much whiskey and leaves me these three faces to feed. In this brief opening to the song, we meet seven people across four generations! We know their occupations and their relationships to each other. We know who is singing the song (the daughter), that she is widowed, how her husband died, and her current situation. With all that rich information in the opening lines of the song, the writer not only has the listener’s attention, but now has the luxury of the entire rest of the song to use valuable syllable real-estate for imagery and character development. This is song crafting at its finest. What do we know after these four lines? How many people are we introduced to? There is the singer, the “you”, and a “they”. Three people. What do we know about any of them? NOTHING. What other pieces of information do we have? There is a ‘secret’, a ‘vision’ and a ‘winding path’. Do we know anything about these? NO. Do we know where we are, when we are, or why any of this is being said ? NO. This puts us in a situation where after a complete verse (usually 30-45 seconds) we have zero information and lots of unanswered questions. Now, this is not yet hopeless – if we immediately get into a chorus that answers all of those questions, we can move on. But if we do not provide satisfactory information here and now, the listener realizes that the writer has all the relevant details locked in his/her head, and is not sharing them The impact on the listener is one of confusion and being kept on the outside. No connection. What do we know? Nothing. Lots of references – three people, a place, a time, a situation, but these references only raise questions without providing answers. Wasted real estate, with the blight of “it” in line 4.
eight-to-eleven minute masterpieces of writers like Harry Chapin and Dan Fogelberg keep the listener rapt for that whole time. Great examples of the payoff-at-the-end technique are Gretchen Peters’ “Independence Day”, “Concrete Angel” by Rob Crosby and Stephanie Bentley, or the above-mentioned songs “Skin” and “Me and Emily”. 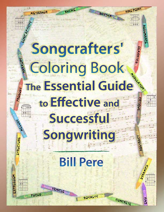 Remember that popularity and good songwriting are two separate parameters (discussed in detail in Songcrafters’ Coloring Book). There are many reasons other than good songwriting as to why a song can become popular: (a) popularity of the artist; (b) major promotion by a record company; (c) tapping into a current fad, trend, or event; (d) visual enhancement (a music video, live performance, or movie placement); (e) smart internet marketing; (f) music business connections/relationships; (g) a great production/arrangement. Average or even mediocre songs become big hits through all of these factors. Popularity does not make them well-written songs. Just think, that if a not-so-well-written song is popular and making money, how much more would it make, how much longer life would it have, and how much more respect would it get if it were actually well-written too? As an independent artist, you are competing with a huge number of other artists who are trying to do exactly what you are doing. You don’t have an unlimited corporate budget or inside connections to turn average songs into hits, so you have just one means of beating the competition – be a great songwriter. There are many great musicians, many great performers, many great producers – but a great songwriter is much more rare, and rarity means value. View your songs as a conversation with someone whose interest you want to hold. Bill Pere was named one of the “Top 50 Innovators, Groundbreakers and Guiding Lights of the Music Industry” by Music Connection Magazine. With more than 30 years in the music business, as a recording artist, award winning songwriter, performer, and educator Bill is well known for his superbly crafted lyrics, with lasting impact. Bill has released 16 CD’s , and is President of the Connecticut Songwriters Association. Bill is an Official Connecticut State Troubadour, and is the Founder and Executive Director of the LUNCH Ensemble. Twice named Connecticut Songwriter of the Year, Bill is a qualified MBTI practitioner, trained by the Association for Psychological Type. He is a member of CMEA and MENC, and as Director of the Connecticut Songwriting Academy, he helps develop young talent in songwriting, performing, and learning about the music business. Bill’s song analyses and critiques are among the best in the industry. Bill has a graduate degree in Molecular Biology, an ARC Science teaching certification, and he has received two awards for Outstanding contribution to Music Education. The New York Times calls Bill “the link between science and music”. 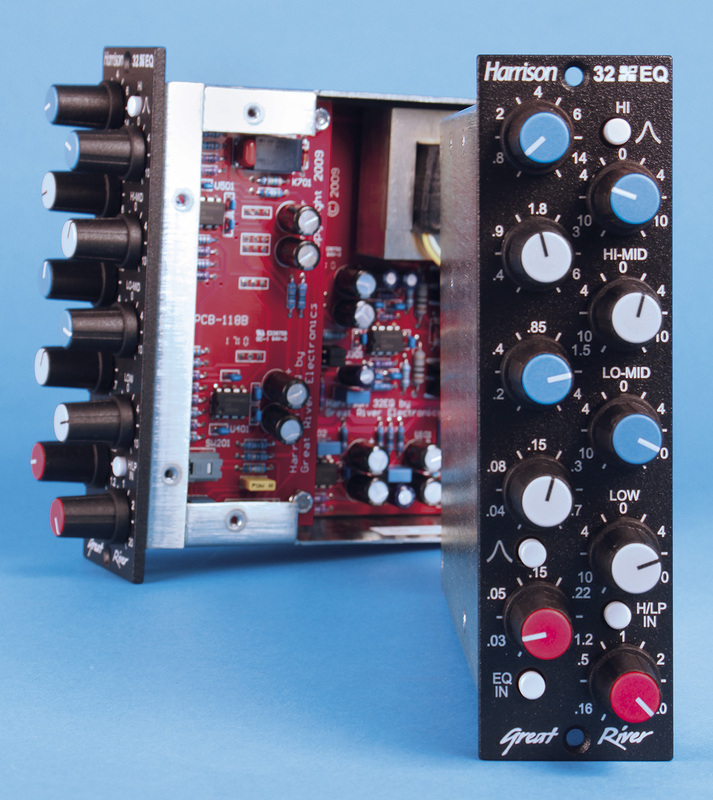 The Harrison 32 EQ is Great River’s 500 series equivalent of the EQ on the famed Harrison 32C series mixing desk. [Renowned for being owned by mixer Bruce Swedien and used to mix Michael Jackson’s Thriller – JT] The 32EQ consists of four bands of proportional Q controls and high and low pass filter controls. Visually, the Harrison EQ appears very clear. There are gain controls for each band on the right hand side alongside the frequency control on the left. The pots are clearly labeled with different colors so as not to get confused between the bands. Furthermore, Great River have included a jumper switch in the back of the module which allows you to switch between a modern signal flow without feedback or the vintage feedback sound. The bands’ frequency ranges are as follows: Low: 40-800Hz, Low Mid: 200Hz-4kHz, High-Mid: 400Hz-8kHz, High: 800Hz-16kHz. One of the most useful elements to this EQ is the proportional Q capability [which means that the width of the eq band (Q) stays relatively consistent in relation to how much you boost/cut. This has the effect, perhaps counterintuitively, of applying the boost/cut to the same frequencies rather than including side frequencies as you add/subtract more gain. In the end, you get the boost/cut where you’d expect. – JT]. This feature of the EQ allows you to avoid the painful task of concentrating on the gear, and rather focus entirely on the music. Being able to control each band with two hands without even looking at the module is ideal to stay focused on the music. This proportional Q capability allows you to make significant adjustments accurately and quickly. Mixing with the Harrison is easy and quick. The frequencies of each band on the EQ overlap with the ones on either side of it which allows the EQ to make extremely creative adjustments. As far as sound quality and timbre are concerned, the Harrison EQ sounds very smooth [I like the expression “musical” as applied to these – JT]. The Harrison seamlessly adds its own color to the overall blend of the sound. Its extreme versatility allows it to be helpful in virtually any mix and on virtually every instrument. From personal experience, working at Digital Bear Entertainment where we have 5 Harrison 32EQs, we have used them on a huge variety of instruments from lead vocals all the way to drums and bass. The Harrison has become our default outboard EQ and we use them in every mix. I highly suggest that every studio have at least two of these. Major record labels always hire producers when organizing a recording project for one of their artists. This suggests that there is are very good reasons to have one. Record labels, above all, never waste money! Today, more and more artists find themselves recording on a small label or entirely independently. Can someone like you take a tip from the large labels to help ensure the success of your project? Hiring a producer may just provide the edge you need. But, what is a producer? You know who the other players in the recording process are. There’s you, the artist, any session players, and the recording engineer. You know what you and the musicians do, and you know that the engineer sets up the mics and does all the knob twiddling to get the sound recorded. So what is left for a producer to do? Fundamentally, the producer’s job is to help you achieve the recording that you (and your label) set out to make. This may sound like the engineer’s role, but many elements other than purely sonic clarity go into the crafting of your final product. On the music side of things, these may include songwriting and arrangement adjustments, as well as coaching musicians and coaxing peak musical performances. In the control room, there are decisions to be made about sonic treatment and creative mixes, while style and popular idiom must be addressed in anticipation of marketing the disc. In short, the producer must keep an eye on the Big Picture. The engineer is already quite busy with the technical side of things, and isn’t necessarily listening with a view to the ultimate creative goals of the project. Further, recognize that it is extremely hard for any artist to maintain this view while in the thick of recording. This view requires an objectivity which is unfair to expect of yourself while pouring your heart into your performances. In essence, the producer is there to help keep you on track. The producer is the go-between: translating the artists’ needs, the engineers technical point of view, and sometimes the label’s interests. 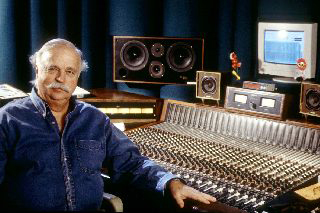 The producer’s role is not limited to the recording studio. Ideally, a producer brings insight to the project’s songs long before recording starts. Many producers are talented arrangers and songwriters who can bolster your songs with their fresh ears. Similarly, producers have often been around the block a few times and have many helpful hints, or even connections, to help you promote your recording. For the indie recording artist, a producer is a good resource for guidance about publishing, mechanical royalties, performance rights, and referrals to the entertainment lawyers you will need. Of course, there are many styles of producing. However, they can be broken down into three general descriptions which are helpful to think about as you begin looking for a producer. First is many an indie artist’s nightmare, producer as supreme dictator and superstar. Certainly such producers do exist, although they are much less common today as compared with the early days of rock and roll. Nowadays, superstar producers, such as Don Was, take a more collaborative approach. The second type of producer is the invisible or documentary style recordist. This producer aims to record just what has happened during a performance with as little influence or intrusion on the events as possible. This is a rare bird in rock music as well, but is quite a common approach to classical, jazz, and even blues recording where the style of music or the written music helps define the style of listening experience expected by the consumer. The third style which is most common and best suited to rock and roll is producer as creative partner with the artist. This often brings together the talents and experience of an outsider with the creativity and vision of the artist. Let us assume that if you were to hire a producer you would choose “producer as creative partner”. After all, it is unlikely that you want to give up all control of your project, but similarly if you’re going to hire someone you want someone who can add creativity and depth to the recording. How do I choose a producer who will work well with me? This is a very personal judgment, but certain general principles apply. Think of this process just as you would think about hiring a new musician. Recognize ahead of time what you expect the producer to do for you and think about how someone might best help you with your project. Begin your search with some professional history of each candidate producer. Get a list of credits, listen to past projects, talk to past clients. Remember, however, that these are just starting points and the best basis for your choice will be mutual “fit”. If you were hiring a new bass player you might consider many factors: can he sing, does she know the style you play, does he have the look, do you all get along, can she both learn the material and contribute to it? 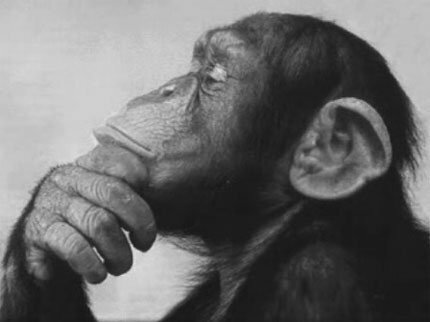 Similarly, ask yourself after meeting with a producer: does he like my music, does she get my music? You want someone who is enthusiastic about your material and knows your genre. Does he offer criticism and is it constructive? You don’t want a wimp who won’t tell you honestly what is good and what isn’t. At the same time you need someone who is sensitive to your pride as a group and as a songwriter. Does his perspective seem helpful? After all, his suggestions must seem to you to be an improvement over the way things were. When you boil it down, a producer is most helpful in assuring that your project arrives where you want it because of her unique position. The producer is a creative partner who will work hard with you to bring out the best you and your material can be. At the same time, he is a relative outsider, not so involved as to be blinded by love of the material. This crucial combination of creativity and objectivity is what hiring a producer is all about. Since time began, runners have needed coaches, orchestras have needed conductors, and likely your next project would benefit from the perspective of a producer.